Win Tickets To The Opening Night of 12 Points! I read this article and found it very interesting, thought it might be something for you. The article is called Win Tickets To The Opening Night of 12 Points! and is located at https://www.totallydublin.ie/arts-culture/festival-features/competition-win-tickets-to-the-opening-night-of-12-points/. 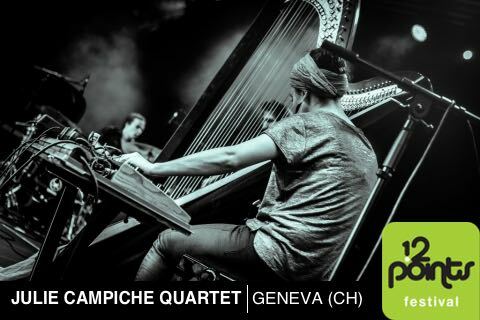 Steering an instrument not associated with jazz into new sonic terrain, Swiss harpist Julie Campiche and her quartet create a dynamic yet uncluttered ‘electro-acoustical’ experience. At just 26, Susanna Risberg is already on her way to becoming one of Europe’s leading guitarists, with shades of Scofield and Metheny, moving effortlessly from groove oriented pieces to straight-ahead contemporary jazz. Diverse sounds from Parisian band nOx.3 featuring Swedish vocalist Linda Olah; industrial minimalism meets traditional ‘chanteuse’ meets abstract noise meets Noir soundtrack, all in perfect equilibrium. What Swiss city does the Julie Campiche Quartet come from? Email your answer with your contact phone number to competitions@totallydublin.ie The competition ends on Tues Aug 21st at 5pm and the winner will be notified by email. Good Luck!